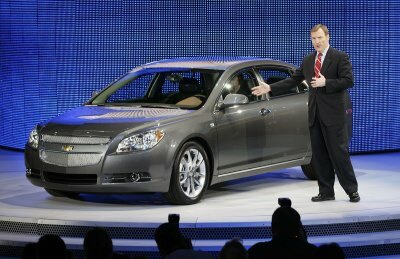 Detroit Auto Show January 8, 2007; General Motors introduced the 2008 Chevrolet Malibu at a media event this morning. The 2008 Malibu features a longer wheelbase that GM says will deliver a smoother, more direct driving experience, as well as head-curtain side air bags which will be standard equipment on all models. The 2008 Malibu's dual-port grille represents the "new face of Chevrolet." There are rumors of a Hybrid option for the very new Malibu, more on that later.